The lower Methow Valley near Pateros was home to over 1,000 members of the Methow Tribe before the group was decimated by smallpox. Editor’s note: For more than 13,000 years, Native Americans have lived along the waterways of the Pacific Northwest. Columbia River tribes share the names of waterways they call home: the Entiats, the Wenatchis, the Chelans, the Lakes, the Okanagans and the Methows. Members of the Miller family are the longest known continuous residents of the Methow Valley. Descended from indigenous Methows, their story is told through generations by the intricacies of their artwork, their native language, their connection to the land and their dedication to building strong communities. They generously agreed to share their story with the Methow Valley News. In a five-part series, we will share the history of the Methows through the Millers. At a recent community meeting in Pateros, neighbors introduced themselves by sharing how long their family had lived in the area. Mark Miller stood, announced his name and quietly sat down. The meeting coordinator reminded him to share how many generations of his family had lived in the area. A few days later, Mark spoke with his friend, archaeologist Stan Gough from Eastern Washington University. Out of curiosity, he asked Gough what the records show in terms of human activity in the area. Gough explained that Mark’s ancestors may have been in the area as early as 5,000 years before the Missoula floods. Recent finds of human activity in the Pacific Northwest provide evidence that people lived along the Columbia waterways for over 13,000 years. For anyone doing the math, that is approximately 520 generations of people. 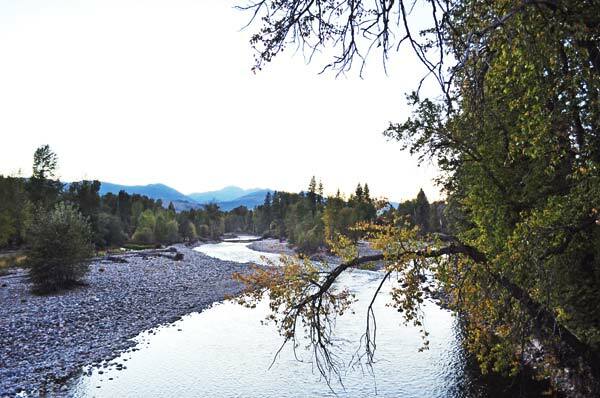 It was near this site — at the confluence of the Chewuch and Methow Rivers — that one of the larger groups of Methow Indians was living in the later 1800s when Pateros was founded further south, where the Methow River joins the Columbia. When Lee Ives — the founder of Pateros, originally called Ives’ Landing — arrived at the confluence of the Columbia and Methow Rivers in 1886, he reported seeing a Native American settlement led by Chief Neekowit (also know as Captain Joe), made up of two dozen tepees. The Methows’ presence at one time consisted of villages located throughout the valley. At the mouth of the Methow River, the town was referred to as “Captain Joe’s settlement” or “Bluffs at the Mouth of the River.” Larger settlements were located at the confluence of the Chewuch and Methow Rivers, the mouth of the Twisp River, and also at Benson Creek. If Ives had arrived a generation earlier, he would have seen thousands of Native Americans. Once home to nearly 2,000 Methow Indians, the valley in 1886 held only a few hundred. The flu epidemic of 1918 was another blow to the tribe. The Millers live on the very last Moses Allotment. The original Moses Reservation, formed in 1878, reached from the Spokane River to the Columbia River to Lake Chelan and north to the Canadian border. Less than a decade later, in 1886, miners and settlers pushed to claim these lands and pressured Congress to eliminate the entire Moses Reservation and force the Native Americans to move to the Colville reservation in the Okanogan Valley. Chief Moses compromised, and negotiated the Moses Allotments. Every head of household along the Methow and Columbia Rivers who wished to remain on land they had lived on for generations was allotted 640 acres of surveyed land. Forty allotments were issued. The Miller family remains on the last existing allotment, MA 27, a piece of history in the Methow Valley. The Miller family members in the lower Methow Valley are direct descendants of Chief Neekowit’s sister, Mary. Siblings Lewis Jr., Thomas Senior, Cyndy, and Mark, along with their families, live on land long inhabited by previous generations of the Methow Tribe. They are also the longest-known residents to continuously call the Methow Valley home. On their father’s side, they are direct descendants of Sam Miller, founder of Wenatchee, and namesake to Miller Avenue there. Sam Miller married Chos Chostq of the Methow Valley. She was also known as Nancy Paul. Mark and Cyndy’s mother, Elsie Miller, was the great-great- granddaughter of Chief Seattle. No matter where you look in the Miller family tree, each generation holds a compelling story of historical significance. Perhaps because of their long-held family ties, Memorial Day is bigger than Christmas for the Miller family. Multiple generations of extended family members come together to honor past generations by, “rebuilding, pulling together, and taking care of ‘here’. Doing it the right way,” Mark said. As they gather to tend both graves and landscape, they tell stories, remembering the lives of the people buried there. “To remember our sister Bobby is very compelling,” Cyndy said, fondly recalling her older sister Roberta Minnis, a cultural anthropologist. A special assistant to Washington Gov. Dan Evans, Roberta was deeply involved in the civil rights movement and worked to improve conditions on Native American reservations. She called for an audit of the Bureau of Indian Affairs and promoted a reformation of the agency. She brought together tribes nationwide to identify common issues and coordinated groups to lobby Washington for change. One common issue at that time was unemployment and poverty on reservations. The government would invest millions of dollars on reservation projects. Complete strangers would descend on the reservation to work, then disappear. The tribes never saw any employment opportunities from these million-dollar investments. Mark recalls the origin of Roberta’s idea that became the turning point of change: “she outlined this idea on a napkin in a hotel room,” he said. The idea was TERO — Tribal Employment Rights Office. The goal was to reduce poverty on the reservations, increase employment, and eliminate discriminatory employment practices by requiring that each business venture on a reservation consider qualified local Native Americans for employment. In the first year, five tribes enrolled in TERO. Ten years later, every single tribe in the nation had signed on. In 1978, after many days of driving long distances to meet with different tribal leaders around the nation, Roberta died in a car accident. Her family believes the accident was the result of pure exhaustion. Family involvement is a common thread. Mark’s daughter Crystal also obtained her degree in cultural anthropology from the University of New Mexico and currently works with the Colville Confederated Tribes. Family is a continuous concept. Younger members of the family are selected to be the “hands and feet” of elders who need care. This practice of cultural responsibility and respect builds a strong connection between the generations of a family: the elders pass down stories and traditions to young adults, and the needs of the elderly are met. It could be said that both Roberta and Crystal continued that connection into their adult years, by extending their knowledge and skills to both preserve the history of a culture, and ensure that the future needs of the people were met. The land in the lower valley, with a view of the “Bluffs at the Mouth of the River” has always been home to the Millers. At times, the dynamics change — as young adults go to college, start jobs, and raise families of their own. But everyone eventually returns to care for their parents and grandparents, and to rebuild homes lost in floods and fires. As Mark and Cyndy spoke, the pride, love, and closeness of the family was palpable. “This land, this family, this is what makes us the Millers,” Mark said with a smile. Coming next: Part 2, the weaving tradition.